Be the first to share your favorite memory, photo or story of Ida Mae. This memorial page is dedicated for family, friends and future generations to celebrate the life of their loved one. She is preceded in death by her husband Carl Loren Carlson; daughter Susan Maypark; and grandsons Jeff and Jason Maypark. She is survived by her daughters Barbara (Robert) Buss, Kathleen (Edward) Ekdahl, and Nancy (Gordon) Carlson; 9 grandchildren; and 12 great grandchildren. Special thanks to the entire Ecumen Hospice team for their loving care, kindness and compassion given to our entire family, especially, Tanya, Jodie, Chaplin Allen, Jennifer, and Denise. Also thank you to the wonderful staff at Parmly on the Lake who took such good care of Mom during her stay. Thank you to Pastor Taryn for her visits and prayers with Mom and our family. To send flowers or a remembrance gift to the family of Ida Mae Carlson, please visit our Tribute Store. 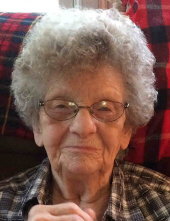 "Email Address" would like to share the life celebration of Ida Mae Carlson. Click on the "link" to go to share a favorite memory or leave a condolence message for the family.